This article is a love letter to Georgia. 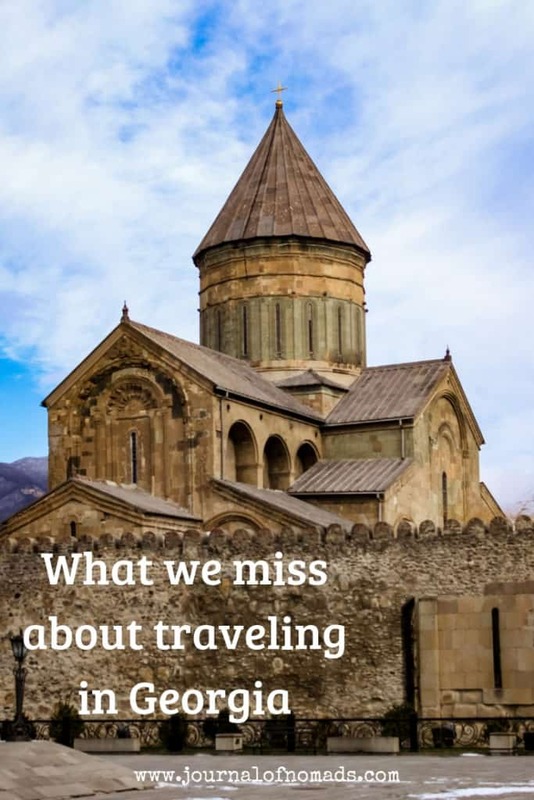 It’s a recollection of all the things we miss and love about this beautiful country nestled between the Caucasus mountains. Oh, Georgia. Just hearing the name of this country brings back thousands of beautiful memories. It’s a country where Cynthia and I lived for a whole year and we just can’t wait to go back. 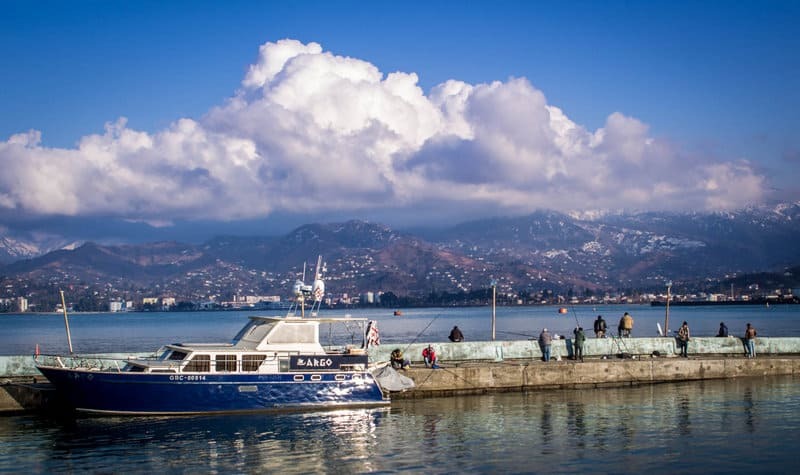 Before arriving there we didn’t know much about this country nestled between the Black Sea and the Caucasus mountains. We were surprised to discover a huge cultural and historical richness, unlike anything we had experienced anywhere before. We instantly fell in love with the country and its people and took our time to discover this gorgeous place. Georgia is one of the oldest wine regions in the world. 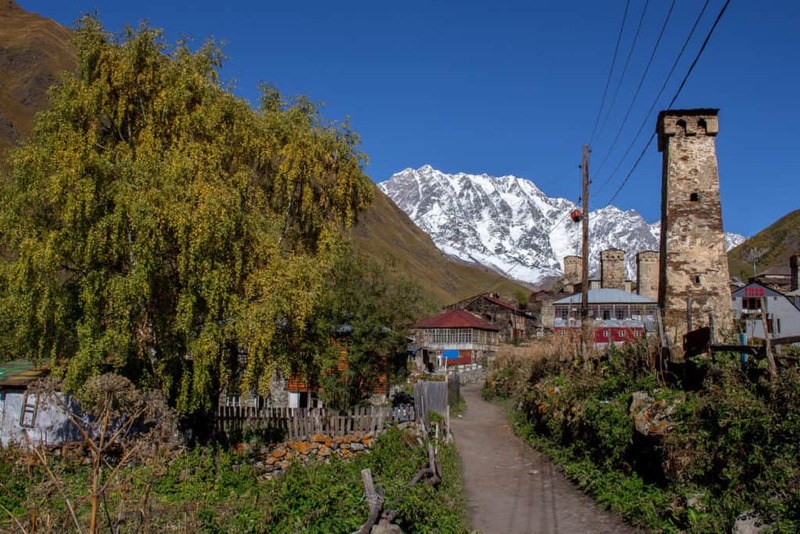 It has its own unique language, incredible hospitality (even the cops are super helpful towards hitchhikers), many spectacular and unique places ( Svaneti, Vardzia, and Chiatura just to name a few), fascinating legends, a beautiful culture, and amazing mountains. 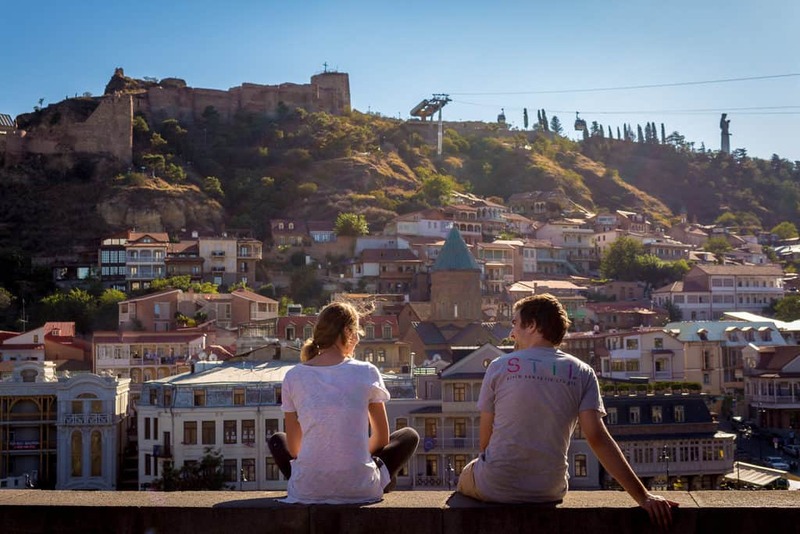 On top of all this, Georgia is a country that is extremely cheap to visit and it’s the perfect destination for backpackers. Want to know how much it costs to travel to Georgia? Read our Budget Guide to Georgia! Georgia has a certain beauty and cultural heritage that is rarely found anywhere else. Looking back now at this country where we lived and traveled for a year, it’s hard not to feel nostalgic. I decided to write down the top things I miss the most about Georgia. 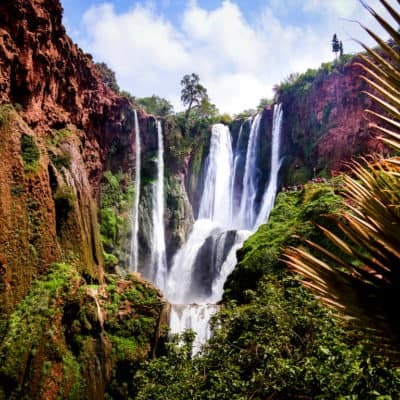 Hopefully, this list inspires you to visit the country one day as well. Georgia is an incredible country. It’s not a very popular touristic destination yet but everyone who visits it for the first time wants to return. One of the reasons why people love this country so much is because of its gorgeous landscapes. It’s hard not to fall in love with a country that has such pristine looking mountains in every direction you look. 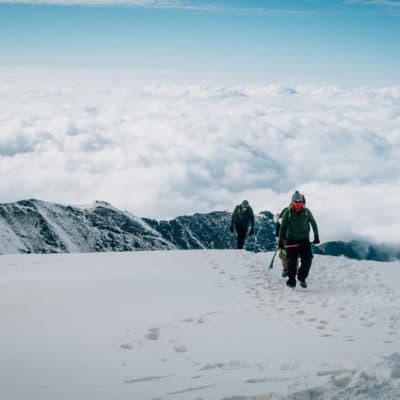 One thing that we particularly miss about Georgia is its high elevation mountain treks. 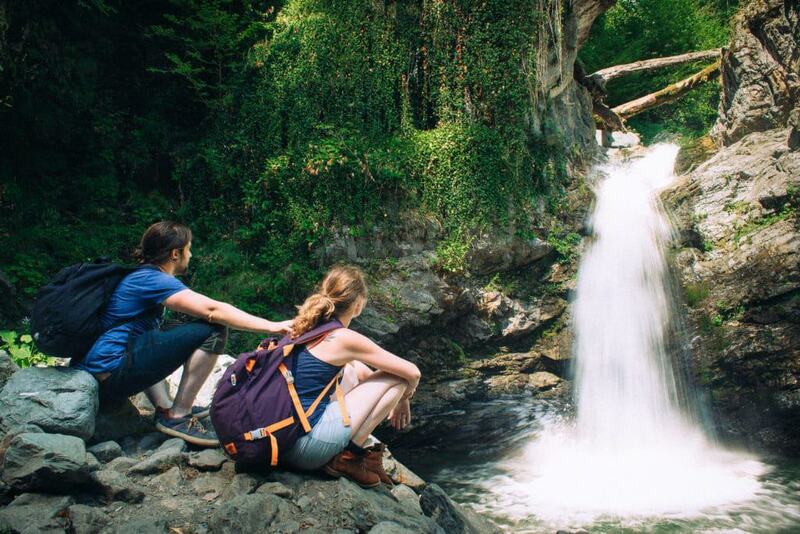 Georgia is a great summer destination if you love hiking. 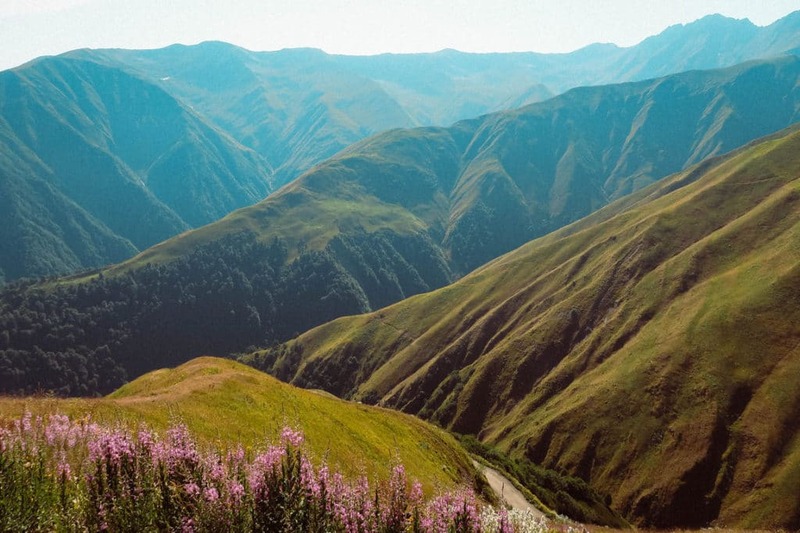 The country is also known as the “Gem of the Caucasus.” There are 14 different mountain ranges across Georgia where you can hike along many routes through breath-taking landscapes and traditional villages. 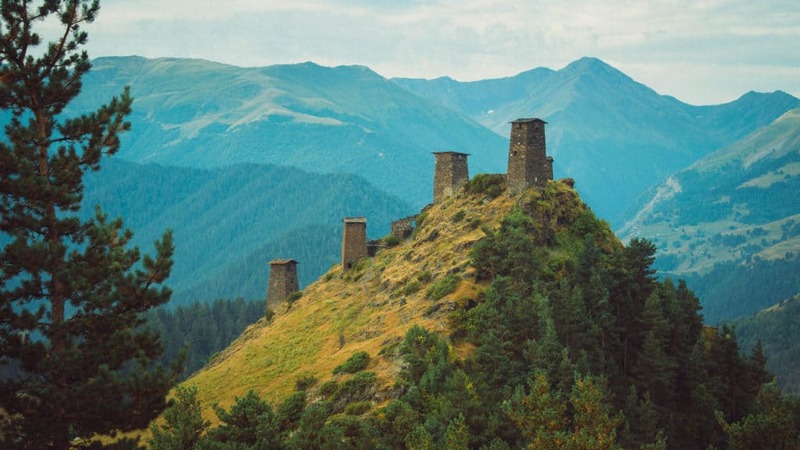 Because the country has so many mountainous regions, some of the most beautiful parts of Georgia are very isolated. 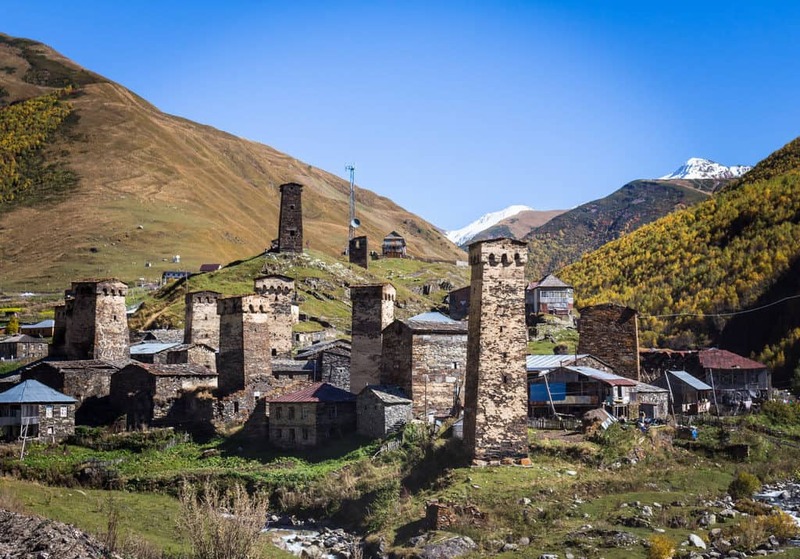 This is the case for two of our favorite regions in the country: Svaneti, and Tusheti. Both of these regions have magnificent landscapes, medieval stone houses, and authentic highland culture. 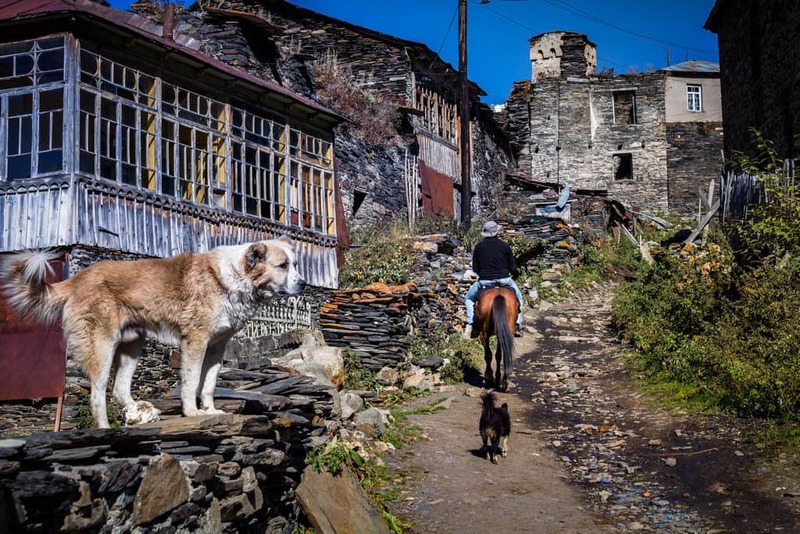 I have many fond and exciting memories of traveling towards Tusheti. Getting there is really not easy. There is only one road that goes to the area over the treacherous 2900m Abano Pass. 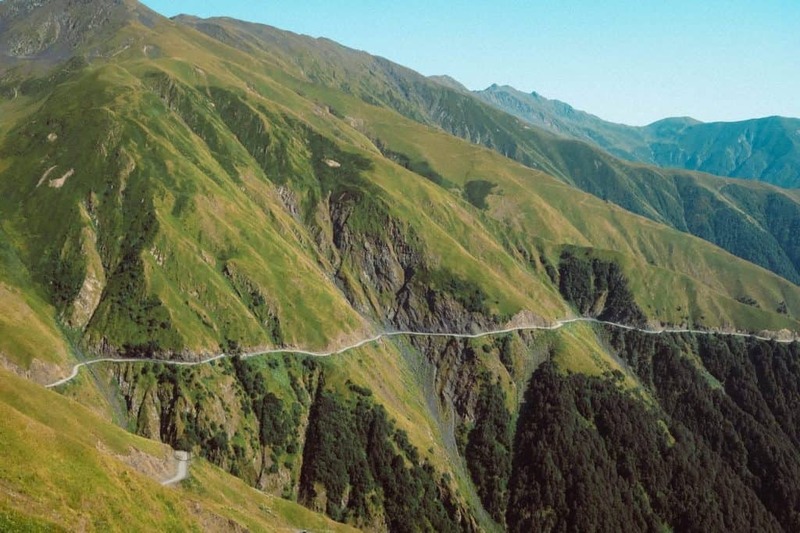 It’s a beautiful mountain pass but it’s also considered as one of the most dangerous roads in the world. Cynthia and I hitchhiked there and I have to say it was one of the most intense and scary rides I ever had. The views along the pass were just incredible! We drove along rivers, pine forests, and alpine meadows and even spotted some eagles along the way! Just thinking about the Georgian food makes my mouth wet and my belly grumble. Georgian food is absolutely finger-licking good. I’m not sure I could ever run out of positive adjectives to describe how tasty the Georgian dishes were. Just to give you guys an idea, I gained fifteen pounds and was at my heaviest weight while living in Georgia. When we visit a new country, Cynthia and I always try the typical dishes as the local cuisine is such a big part of a culture. In Georgia, I might have overdone it a bit! 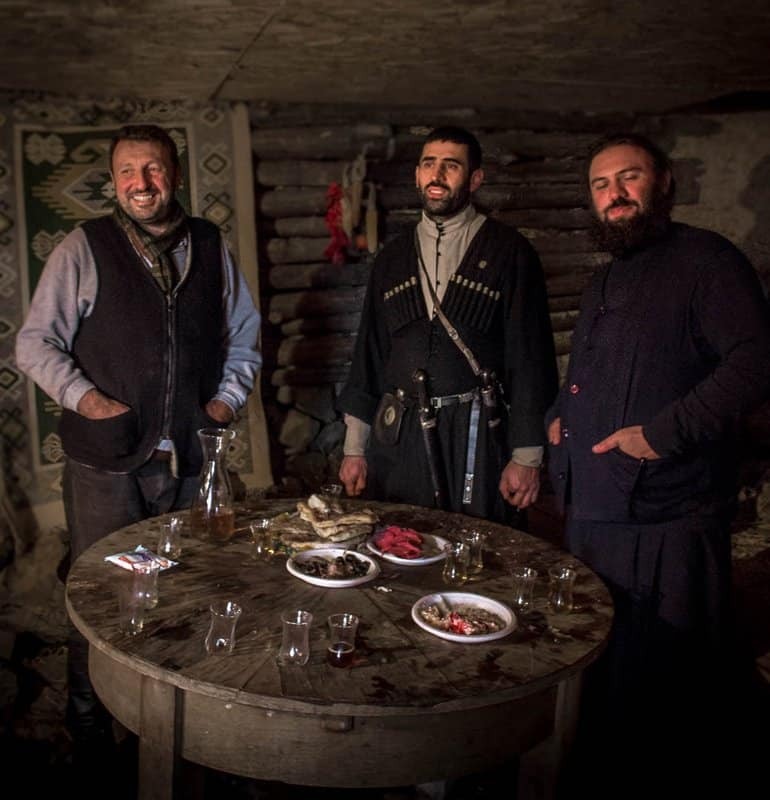 The Georgians are very hospitable people and whenever they would invite us for a meal – which happened often – we wouldn’t leave the table feeling hungry. We often got invited for dinner by Georgian friends and every time we finished our meal – which would usually take a couple of hours – our belly was bursting out of our pants. Enjoying the Georgian hospitality – and food!! Georgians love bread, cheese, meat, and beans. These ingredients form the base of some of the most delicious dishes the country has to offer. One of my favorite dishes in Georgia was the Khajapuri. 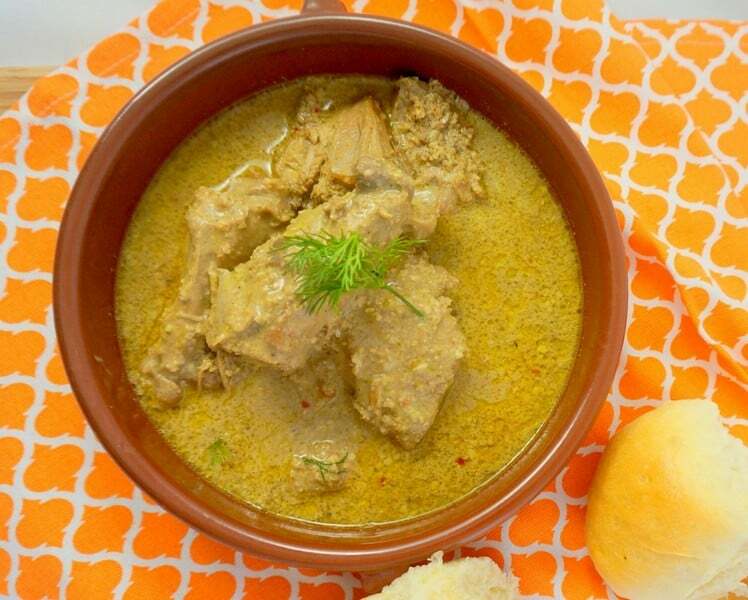 It’s probably one of the most popular and traditional Georgian dishes. It’s a gooey cheese-filled bread that looks a little like pizza and it’s rich in carbohydrates and dairy. 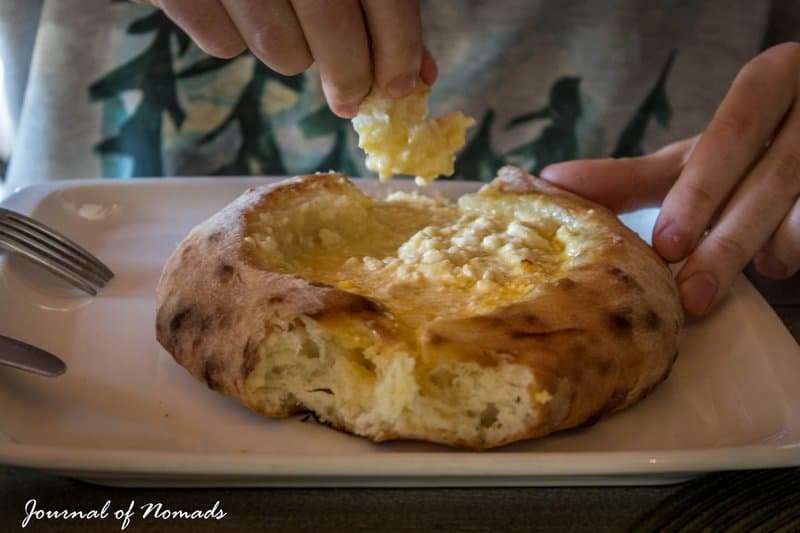 If you would like to see a list of the best Georgian dishes, have a look at 10 dishes from the Georgian cuisine you absolutely have to try! It would be hard to talk about the delicious food we had in Georgia without mentioning the countless glasses of wine that we had with every meal there. Cynthia and I have a little tradition that we started in Ireland. Once a week, no matter where we are, we treat ourselves to a bottle of wine (except for when we’re in Morocco…). We tasted good wine from Italy, France, Greece, and Turkey, but never on our travels did we come across Georgian wine. We had no idea they produced wine in the Caucasus mountains. One thing I can say though is that since we tried it, we’re hooked! 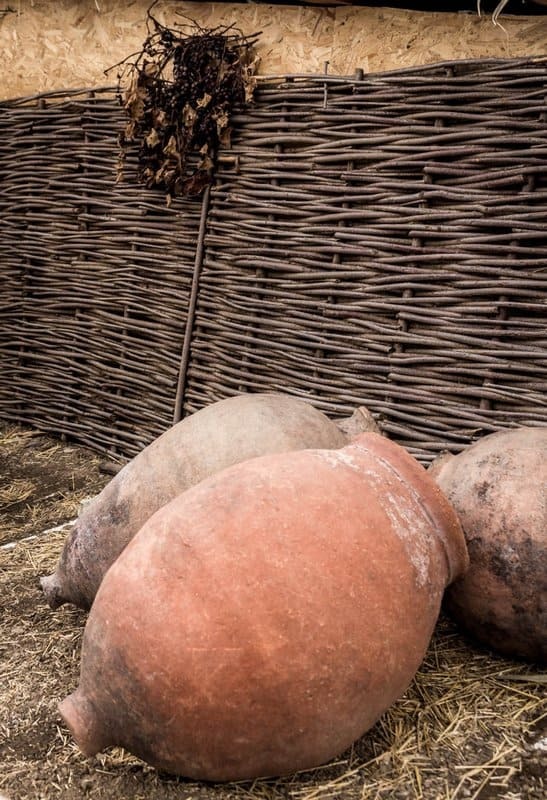 In Georgia, wine has been produced for more than 8,000 years—that’s a long while! 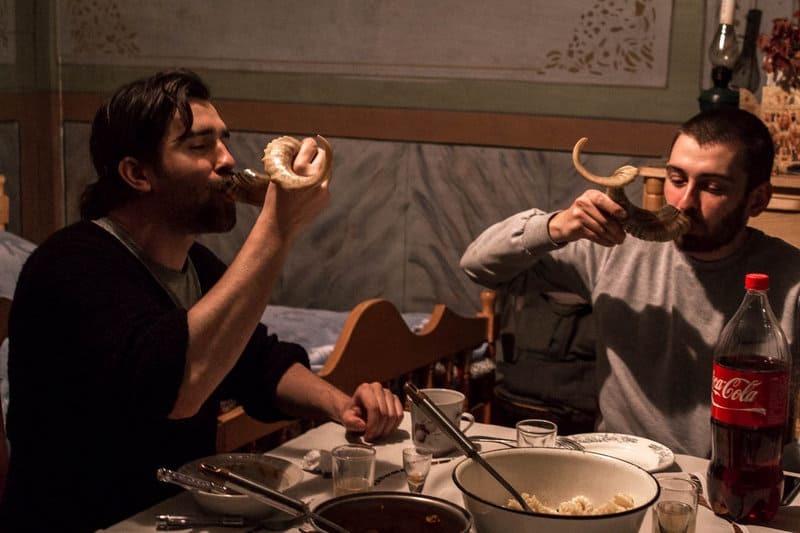 The Georgian people have been raising their glasses and toasting to one another over tables filled with extraordinary food for all that time. A special wine that is unique to Georgia is the orange or amber wine. It’s made by fermenting grapes in a clay jar called a qvevri. It’s traditionally used to toast anything from God to family and a shot of this wine is drunk from a ram’s horn. But what makes Georgia unique in the wine history is the toasting. 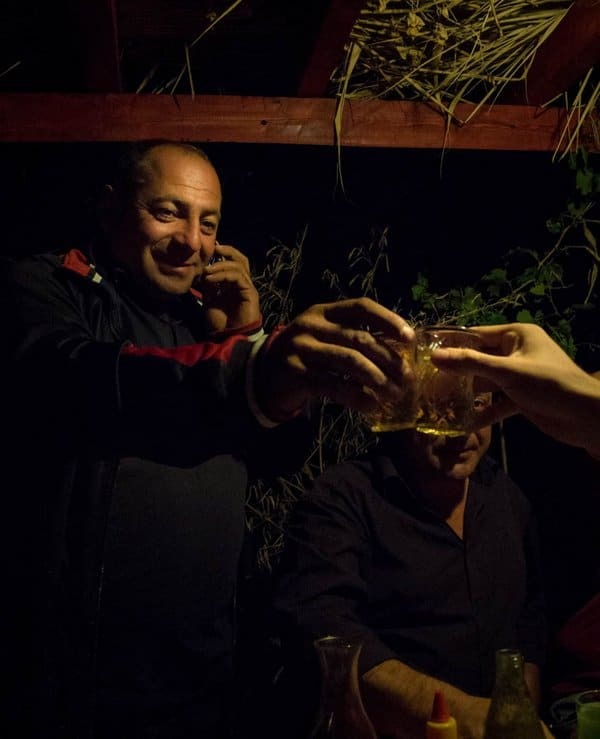 Making a toast was – and still is – a cultural and spiritual tradition. The wine that is offered to people is a symbol of love, hospitality, and positive energy. Your glass will always be filled with wine but you’re not always expected to drink it. The Georgians just want you to be able to toast with them. And they toast abundantly! First, there are ten basic toasts in the following order: to God and peace, to Georgia, to the deceased, to the children and life, to a special celebration (birthday, graduation, achieving a goal,…) to parents, to women, to friends, to love and to the host family. The toast is made by a “tamada”, a toastmaster. He is chosen by the group or the host. A successful tamada has to be able to create a nice speech and at the same time drink a great deal of alcohol… which is not as easy as it sounds. 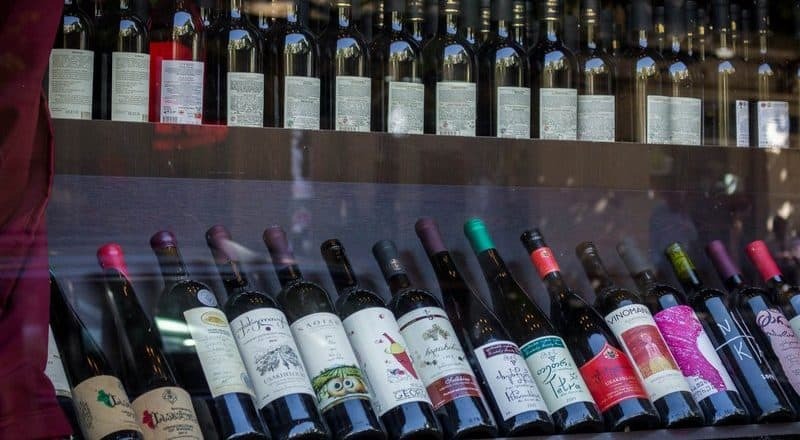 To read more about the delicious Georgian wine, the way it’s produced and the traditions that surround it, have a look at Oh Georgia, sweet mother of wine! Georgians believe that every guest is a gift from God and this partly explains why every foreigner in Georgia seems to be treated so amazingly. 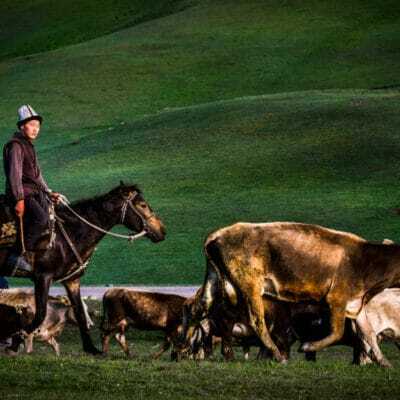 It’s not uncommon that foreign tourists visiting this destination report being invited to stay in mountain villages while hiking, being personally escorted around and fed on a daily basis. Georgians are generous at a level that just cannot be put into words. Throughout our whole year in the country, the Georgians we met went above and beyond to make sure we had a great experience there. 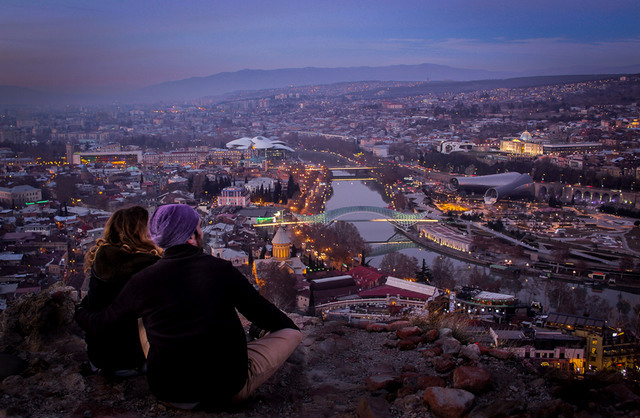 We met a beautiful family that would invite us for a meal once a week in Tbilisi to share stories and a fun evening with us. We also had the nicest neighbor in Gori who would show us around town and take us on trips to the surrounding mountains. Needless to say that the main reason I love Georgia is for its people. Georgians deserve a trophy for kindness and generosity. 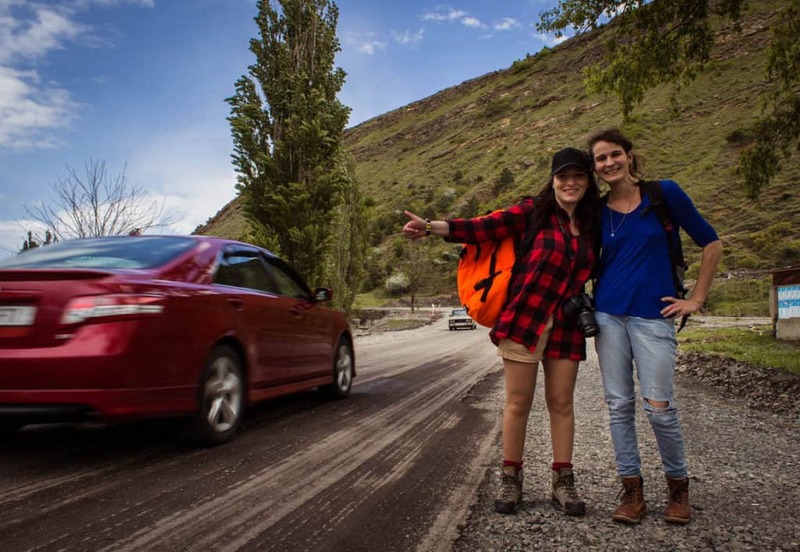 While hitchhiking in Georgia, we also witnessed how kind and helpful people were. One driver out of two that would pick us up would invite us to his home for a meal. We even had a driver who left us with 5 liters of wine on the side of the road as a parting gift. In Georgia, everyone is super friendly. Even the cops! They are super helpful to foreigners and will go out of their way to help you if you need assistance. 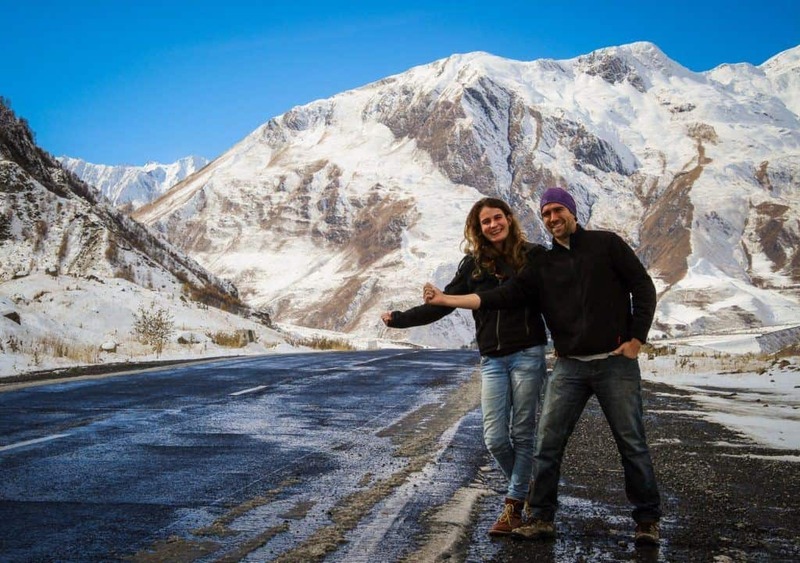 Our friend Taylor wrote about his encounters with the Georgian police while he was hitchhiking there. Another thing that we miss about Georgia is the vast amount of traditions that are totally unique to the country. Here a few that we loved and that made us feel at home in Georgia. Georgia has some beautiful and gorgeous traditions that stood the test of time. One of these traditions is Polyphonic singing. It’s basically some oral stories and legends that are sung by a choir in a beautiful ensemble of chants and deep melodic tones. Although choirs and Acapella singing groups are not exclusively found in Georgia, what is so peculiar in this country, is that this is something that seems to be practiced by the whole population regardless of age and gender. Polyphonic singing is an ancient art and has been part of the Georgian culture for millennia. For Georgians, it’s part of their national identity and pride. Oral transmission of these songs continues to the present day exactly as it has for centuries. songs are learned by each new generation from the previous one. They are sometimes passed down in families or villages, with close attention paid to the teacher’s manner of singing, the intonation and the unique regional styles of ornamentation. The richness of the songs coming from this tradition is absolutely stunning. Georgia has nineteen official provinces and eight major regions. Singers, especially older singers, of traditional music from one region may not be familiar with the songs and styles of other regions. This creates a very unique group of songs for all of the Georgian provinces. 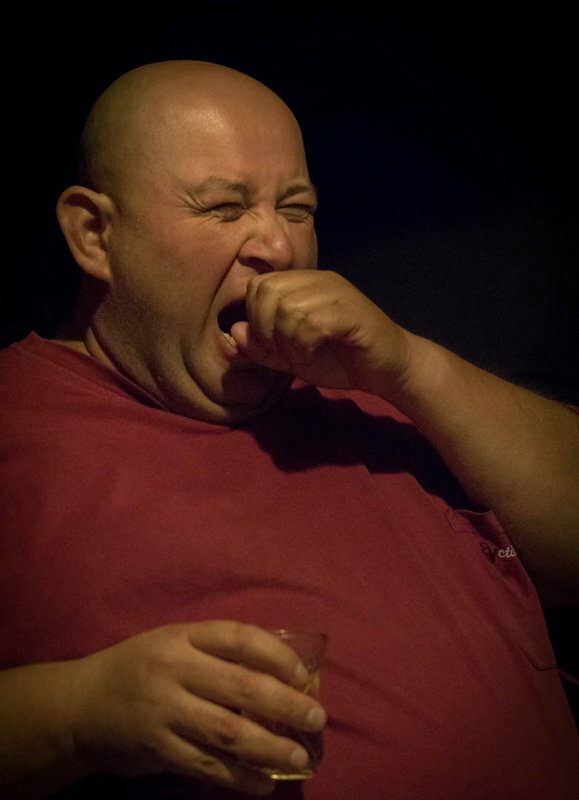 It’s very common that Georgians will start singing all together when sharing a few bottles of wine and a good meal. Cynthia and I enjoyed this so much and we often took part in the singing, if we had stayed longer we would maybe sing perfectly by now. Not only does Georgia have some of the most beautiful Acapella singing ever, it also has some of the most amazing traditional dances you could see. Just like with Polyphonic singing, each region of Georgia has its own particular traditional dance. It portrays the history and customs of that part of the country. The mountain dances are totally different from valley or lowland dances. The costumes that are worn are also different for every dance and resemble clothing of the past in different regions of Georgia. Another interesting Georgian tradition is the habit of celebrating the New Year twice. It is celebrated as normal on January 1st, and then once again on the 14th. This date is known as ‘Old New Year’, according to the Julian calendar. Imagine our surprise when we realized we would be celebrating New Year twice! Yay! Two parties and twice the amount of wine! January 2nd is also a day that has a special significance for the Georgians. It’s called Bedoba, which means ‘a day of luck’. Georgians believe that whatever happens on that day is how the rest of the year will be, so during Bedoba, most people will avoid work and try to be as kind and helpful to each other as possible. Making a complete list of all the beautiful Georgian traditions that we were exposed to while visiting the country would be impossible. All I can say is that these beautiful rituals and beliefs give a charm to the country that is not found in so many other places around the world. 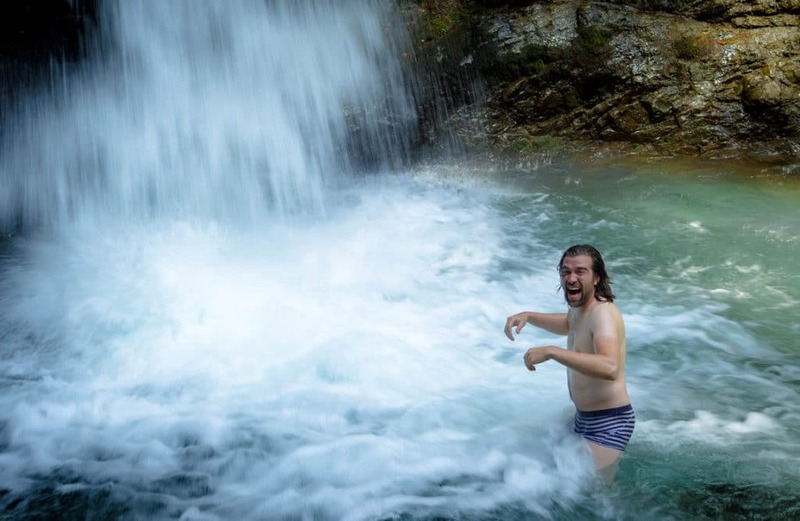 There was never a dull moment in Georgia as there was always a new unusual place to see and discover. You could spend a whole year there and even if you visited a new destination every week, you wouldn’t have time to cover the whole country. 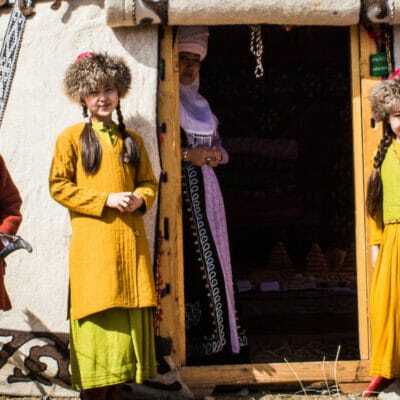 I still treasure the memories of visiting these sights with Cynthia and we often reminisce our trips between the Black Sea and the Caucasus mountains. 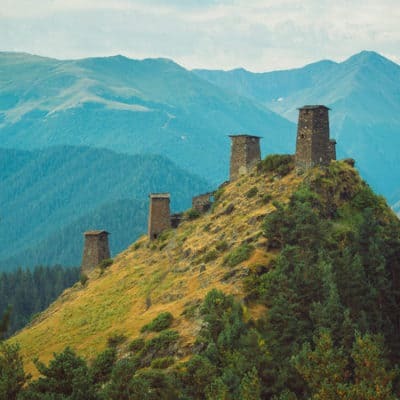 The following places are so unique that you absolutely must visit them on your next trip to Georgia. Vardzia is a huge cave monastery near Aspindza in southern Georgia. It looks almost like a movie set from Lord of the Rings. 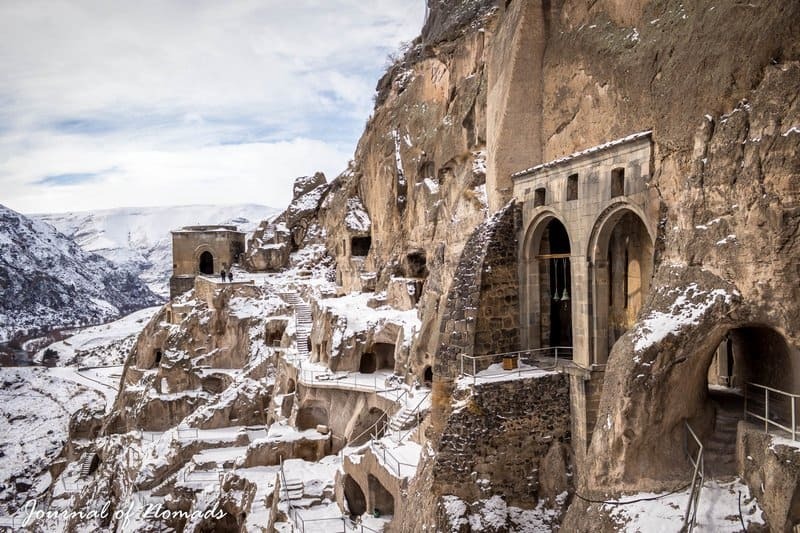 Instead of being the home of dwarves, it’s the home of Georgian monks. 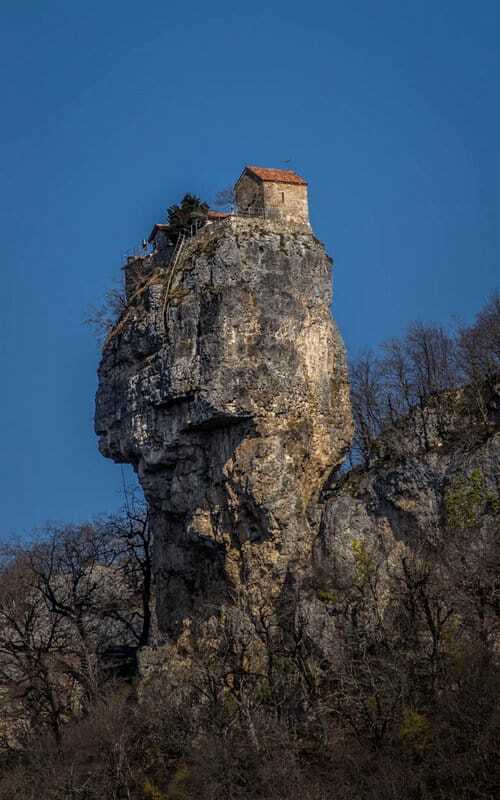 This rock cliff monastery was built in the 12th Century, under the reign of King Tamar, the first woman that was ever crowned as a king (not a queen!) in Georgian history. 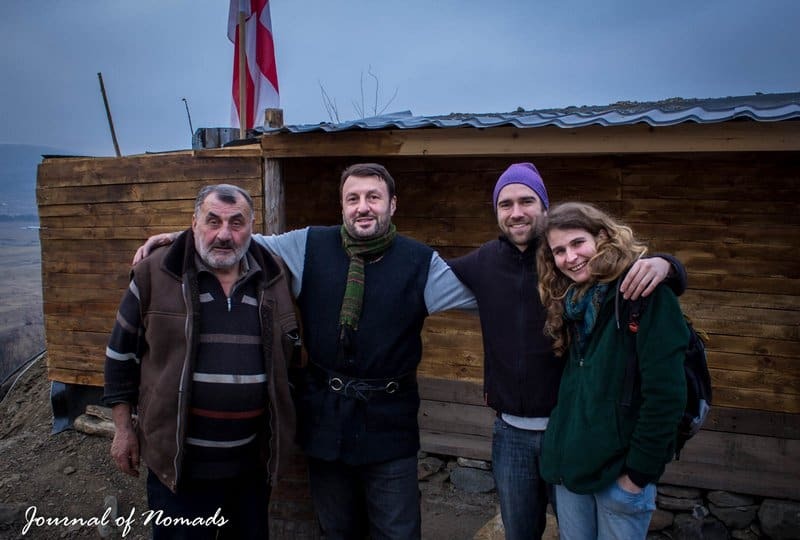 We visited this spectacular place during winter and our trip there was super special as we were accompanied by the film crew of the Georgian TV station Rustavi 2, who was filming a documentary about our journey! 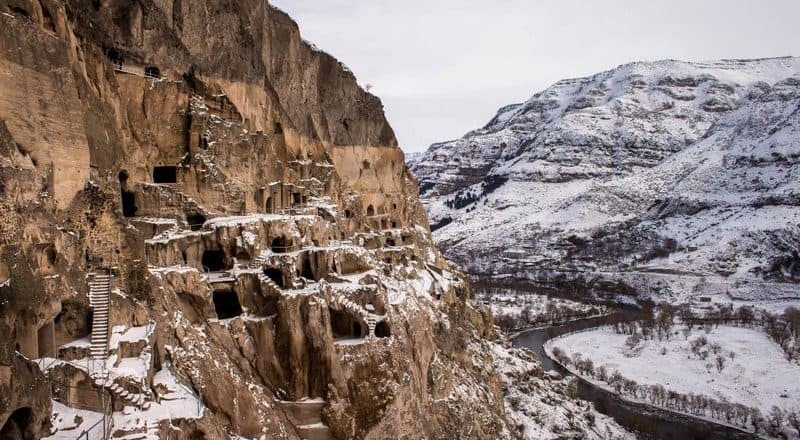 Vardzia is one of those few places around the world that have stood the test of time. 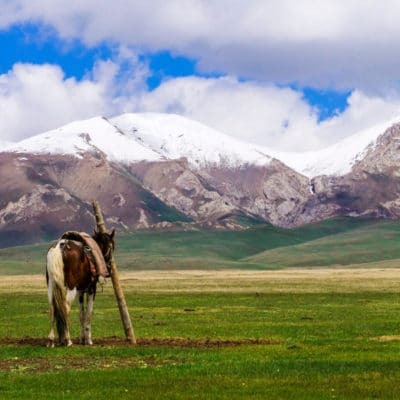 It survived Mongol invasions, an earthquake, and various torrential rains. Visiting this cave city felt very special and I was impressed by the solid, unaltered beauty of the place. If you would put me on an airplane to Georgia tomorrow this is probably one of the first places I would visit. The Katski Pillar is a huge limestone monolith with two churches on top of it. 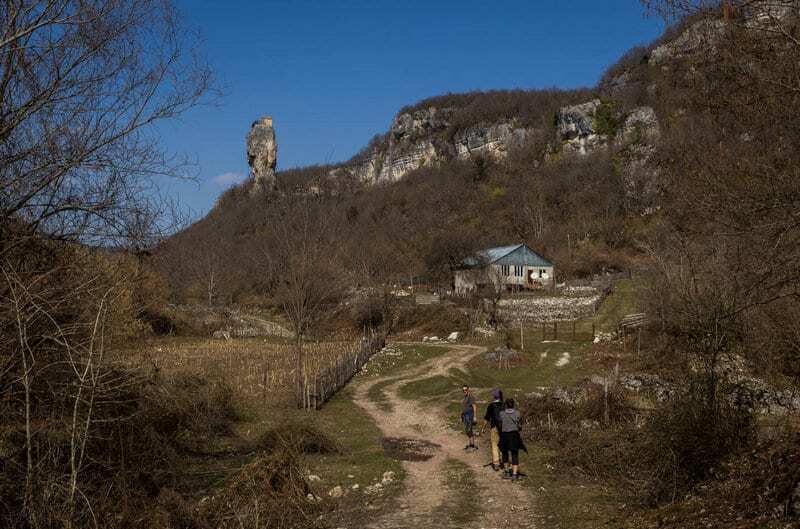 These churches standing on top of a narrow rock pillar might look really bizarre for some but we found it quite impressive and the nature surrounding the monasteries has very peaceful energy. 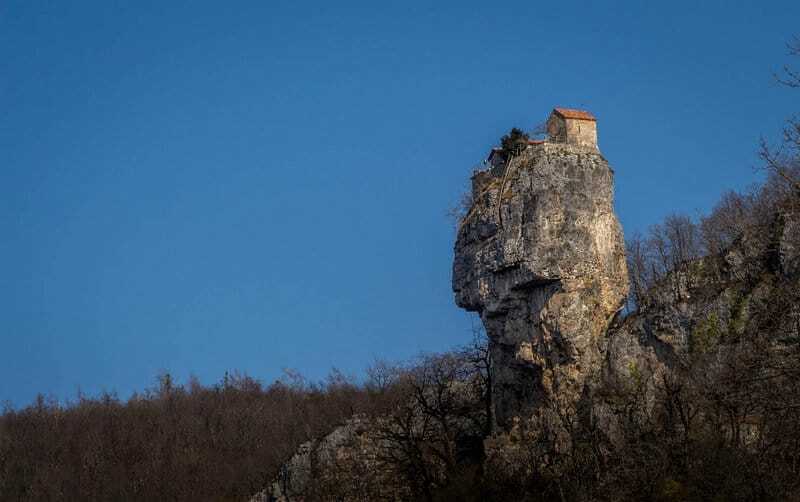 One of the churches was built between the 6th and the 9th centuries by the Stylites, a group of early Christian ascetics who had an obsession with narrow pillars. These “pillar monks” loved spending long periods of time sitting or standing on top of a pillar so they could be closer to God. The beauty of Katskhi is how the pillar is so narrow and yet it still stands strong after all that time supporting these churches. If you ever visit Georgia, I strongly advise you to make a day trip from Tbilisi to this rock pillar. 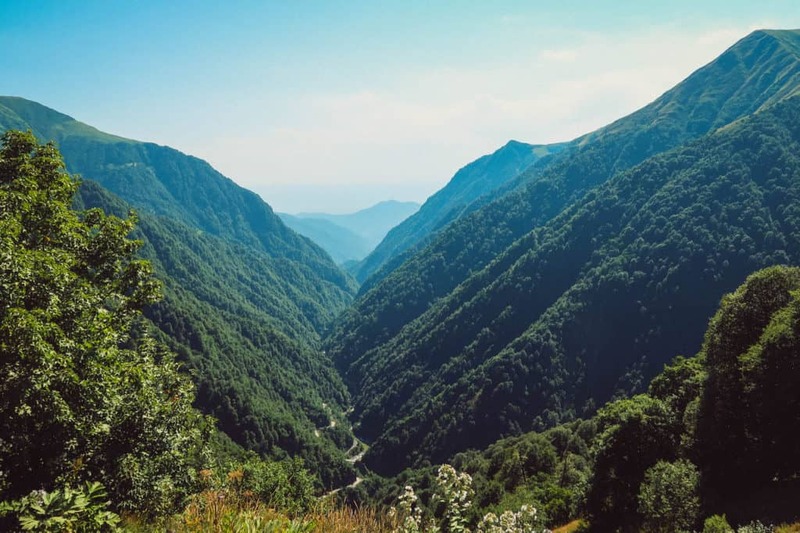 Visiting Chiatura is something I would recommend to everyone traveling to Georgia. 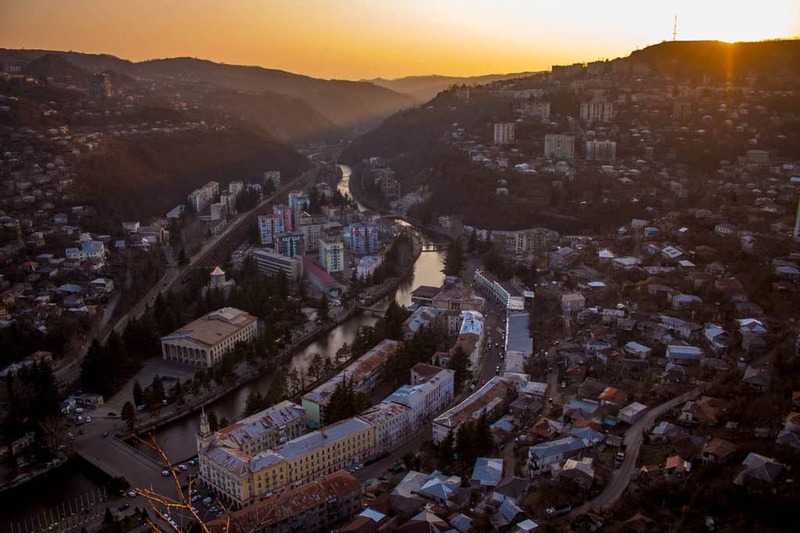 Imagine a city in the bottom of a valley surrounded by Stalin era rusty cable car. These old soviet cable cars were used when Chiatura was a booming Manganese mining town in the early 50s. 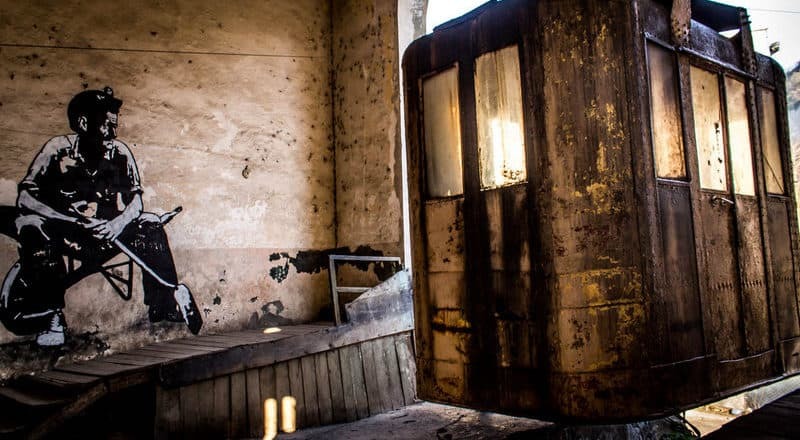 When we were standing in these dark, metal boxes with hot sunlight coming through the few small windows, dangling 20 meters above the ground, we could understand why these claustrophobic carriages were nicknamed metal coffins. Being so high above the ground in such a precarious situation was scary but really thrilling and exciting at the same time. Although it seemed for us a bit strange and slightly uncomfortable to ride these metal cabins, for the locals it’s like taking a bus daily to work, to the shop or to meet their friends. 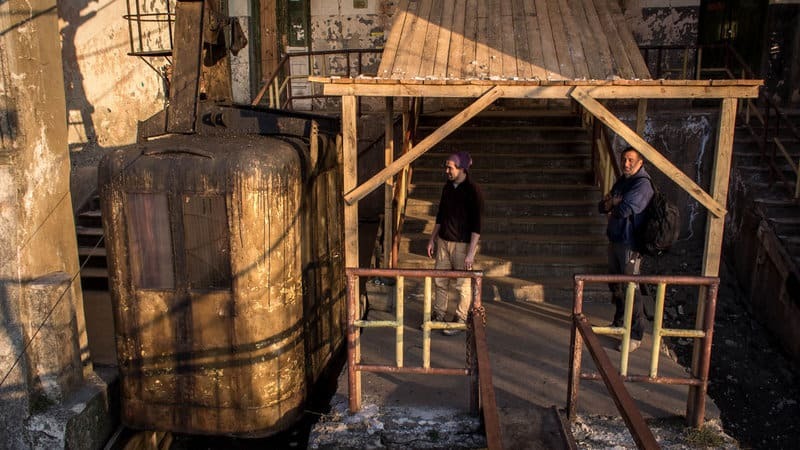 If you want to feel how Georgia was during the Soviet era and feel like you’re traveling back in time, put a bit of time aside to visit ghosts of the past in Chiatura – the Cable Car City of Georgia. When I tell people how much I loved and miss Batumi, they usually find it strange. 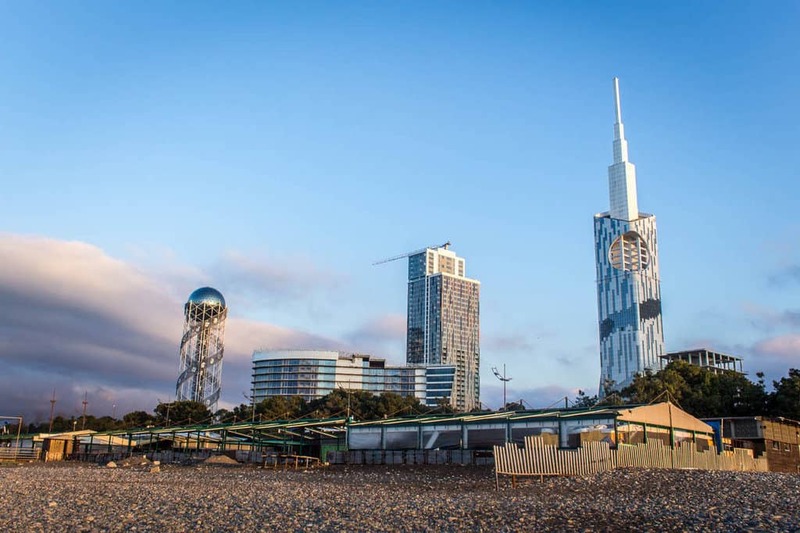 Batumi is a city that is usually famous for its casinos, bars, and nightclubs. If you are a longtime reader of this blog, you probably know by now, that this is not what Cynthia and I are into. 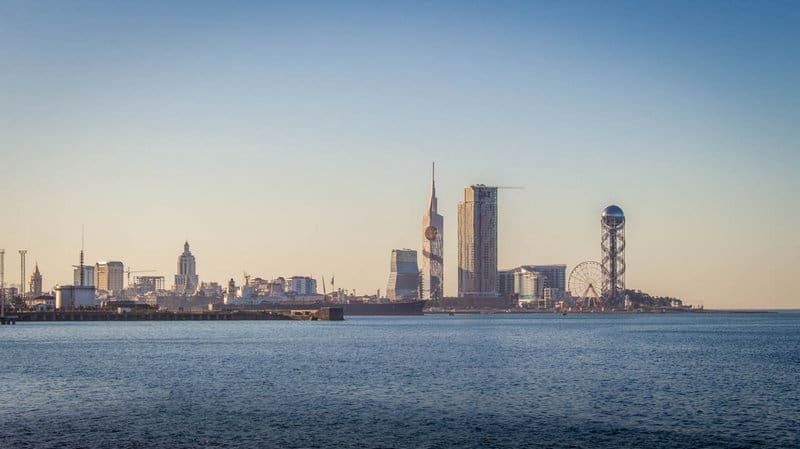 The first time we saw Batumi, let’s say it wasn’t really love at first sight. It gave us the impression of a little Las Vegas where tourists from Turkey and Russia would gamble the night away in its casinos. Four months later we went back for a brief visit. 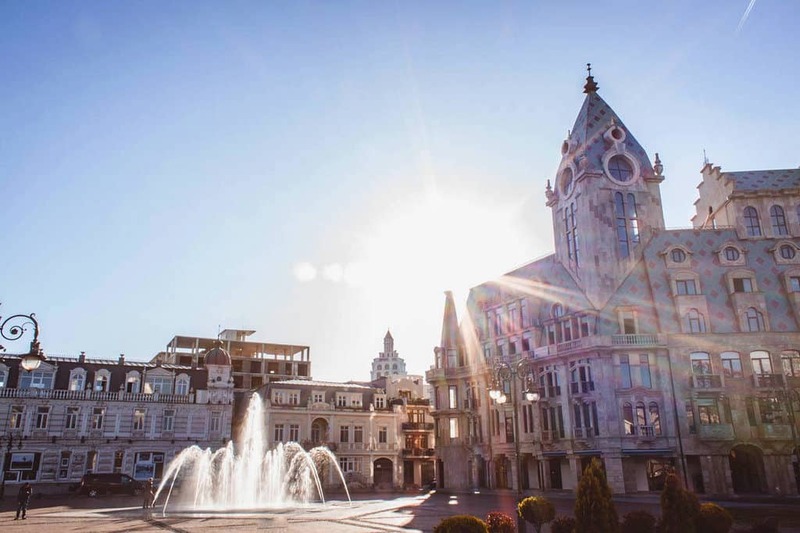 The only reason why we gave the city a second chance was because a friend had asked us to go on a trip to Batumi with her. We were so glad we gave this city a second chance. It wasn’t just the stunning view over the snowy mountains on one side and the dark blue sea on the other that enchanted both of us. There was something about Batumi that we really liked. It’s a beautiful city in its own crazy way. We were marveled and left speechless by the strange architecture of the city and we really enjoyed its refreshing vibe. It felt so good to feel the sea breeze on our skin again. We loved it so much that after just spending one day Cynthia and I both decided we would live there for a few months. It would be really hard to write a complete article that would mention absolutely everything we miss about Georgia. This list isn’t complete as there are so many more things we miss about this beautiful country. Georgia has stolen our hearts and I’m convinced that if you visit this country you’ll also fall under its charm. 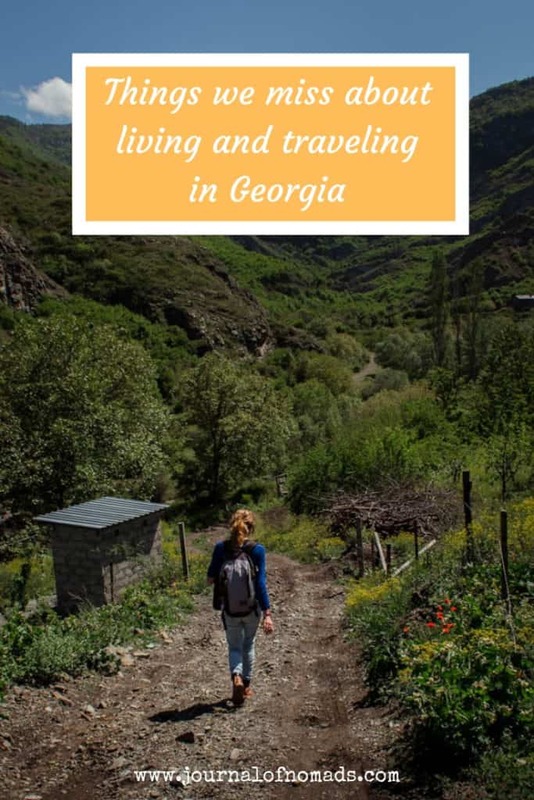 Have you also visited Georgia and do you also miss this gorgeous destination? Do you plan to visit it soon? Let us know in the comments below. 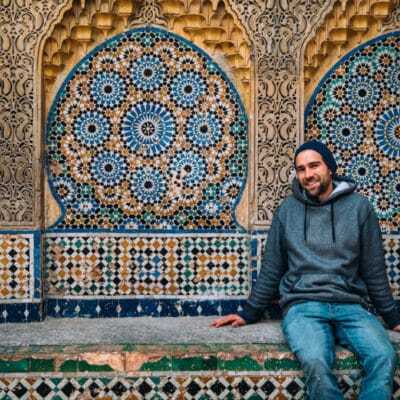 * BACKPACKING IN GEORGIA – HOW MUCH DOES IT COST? * OH GEORGIA, SWEET MOTHER OF WINE! I miss Georgia too! I’ve been there three times already and spent there about four months in total, but still so many places to explore. Sure, that would be great 😄 I went there last year for GEM Fest, but it was canceled so I ended up in Tusheti and Lagodekhi for the first time. The cancellation was worth it!